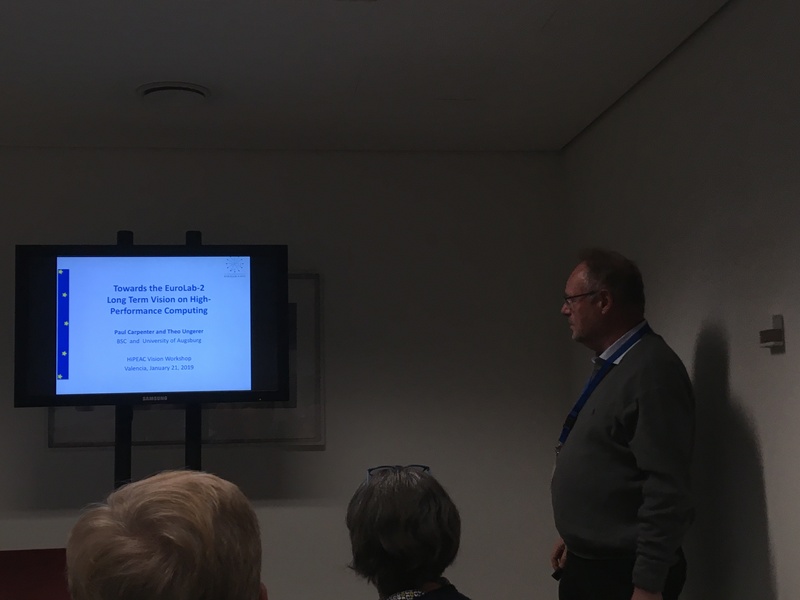 During the HiPEAC Conference in Valencia, the Eurolab4HPC roadmap was presented by Theo Ungerer from University of Augsburg. The Eurolab4HPC Vision will be continued within the successor project Eurolab4HPC 2 (2018-2020) with a planned new Vision release in January 2020. Coordinators of the Eurolab4HPC2 vision document, Theo Ungerer and Paul Carpenter (BSC), are working on a new vision document. They are collecting feedback on the current Eurolab4hpc Vision www.eurolab4hpc.eu/vision/. Combined with a close collaboration and with regards to the HiPEAC vision, ETP4HPC Post-exascale Vision, European Processor initiative, German GI/ITG initiative on disruptive technologies in Computer systems and PRACE scientific cases. Also the Vision Expert Group will be selected accordingly.